If there is a cuisine somewhere in the world that doesn’t rely on onions for basic flavour, I a m unaware of it. My house is often redolent with the smell of onions. In France mirepoix almost always includes onions. In Italy soffritti is a finely chopped onion mixture combined with other aromatics and used in sauces. In Sicily cipolene in agrodolce is a lovely dish made with white wine, wine vinegar and sugar which is why I am going to prepare something like this dish for you today. 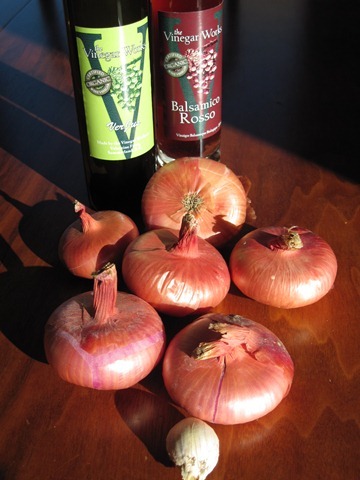 Vinegar, as always, is a key ingredient and a big part of the Vinegartart repertoire . Onions, shallots, leeks, chives, scallions and garlic are all closely related. They all belong to the Allium genus. Onions have a long history and have been cultivated since prehistoric times. Herodotus said that onion, radishes and garlic were part of the staple diet of the workers who, in the third millennium, BC built the Great Pyramid at Giza – no small task. 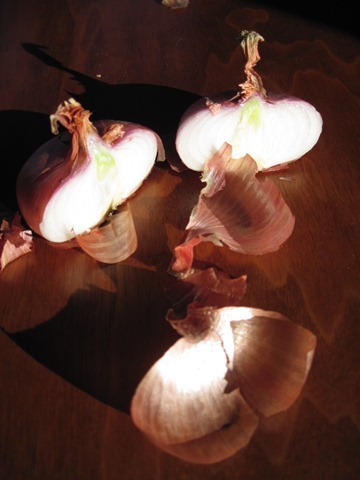 One Allium folktale relates that after the fall of man when Satan left the Garden of Eden, onions grew on the spot where his right foot touched the ground, and garlic from where his left foot touched the ground. 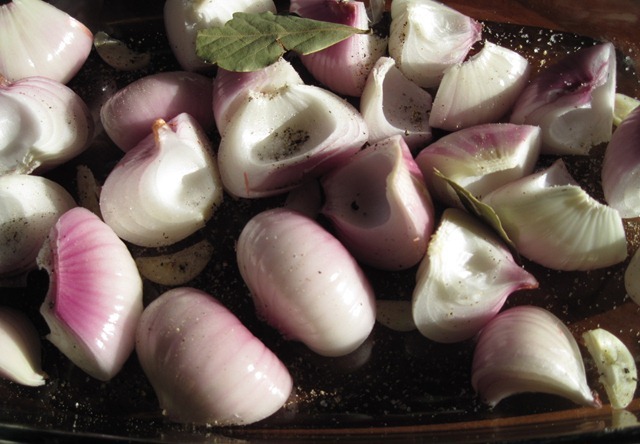 In a 4th century Roman cookbook by Apicius there are a number of onion recipes. So, the onion has been with us and will continue to be with us for a long time. When buying onions, look for firm ones without green shoots. They should be stored in a cool, dry place away from moisture. You should not be storing your onions in the fridge, under the sink or near vegetables that give off moisture – like potatoes. Of course, you would never do that. Borettana are heirloom onions with a squat, flattish cipollini shape and this is the onion I am using for this recipe. This is a very easy recipe to make however, depending on your onions, it may take anywhere from 1 hour to 1 hour 30 to roast them. This dish can be served warm or at at room temperature. 2. Peel and quarter onions leaving enough of the root attached to help the quarters stay together. Arrange in a shallow roasting pan. The roasting pan should be small enough for the onion quarters to touch. 3. Add garlic and bay leaves. Sprinkle with olive oil. 4. 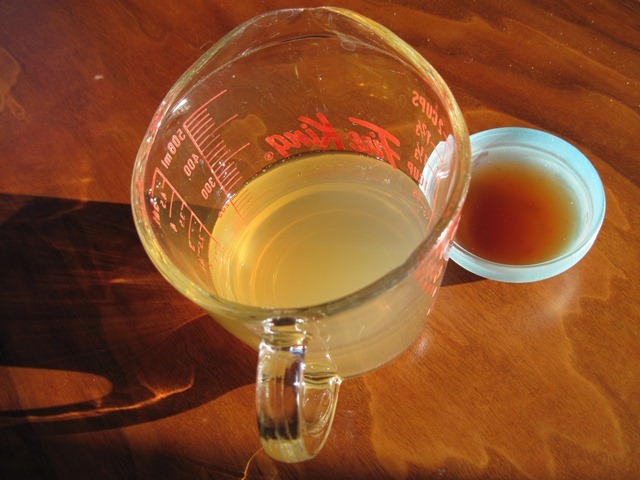 Mix VerJus, Red Wine Vinegar and sugar together to dissolve the sugar. Pour over onions. The VerJus should come halfway up the sides of the onions. Add a bit of water if necessary. 5. Salt and pepper to taste. Cover tightly with tin foil. 6. 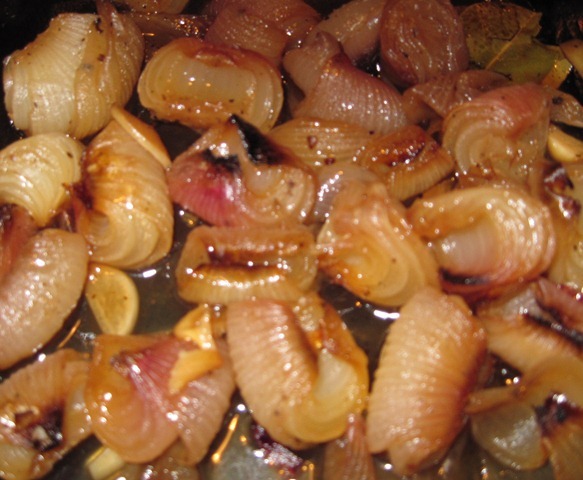 Bake onions for 30 minutes until they start to soften and release some of their juices. Remove tin foil and raise oven temperature to 400F and bake for 1 hour or until the onions are soft and the liquid has reduced to about 2 tablespoons. Do not disappear to finish the grouting. The liquid can totally dry up and your onions can burn because if added sugar and the natural sugar in the onions– a certain amount of carmelization is a acceptable. 7. Transfer onions to a serving dish and enjoy!